Nerastarel's House is a derelict manor in the northern half of Skingrad. It is located between Lazare Milvan's house and Summitmist Manor and is home to leveled undead. The box does not respawn. No explanation is ever given to the mysterious presence of undead in the house and no NPC named Nerastarel exists in the game. 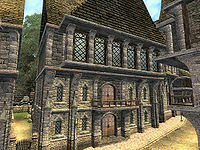 No citizens of Skingrad ever make any mention of the house or its missing owner (except Amusei during Lost Histories), so it is assumed that no one knows about the undead inside. Although the interior of the house seems abandoned and ruined, this is not apparent from the outside, with the exception of the tree in the backyard, which looks dead, toppled and burnt. Behind the house is a well, near which you will find the book Lost Histories of Tamriel during Lost Histories. Despite being "abandoned", entering the house is still considered trespassing. Unfortunately, the undead do respawn after 24 hours so using it as a house is not advised. The type of ambient music for the ground floor of the house is "Dungeon", but for the bedroom, it is "Town". Esta página foi modificada pela última vez à(s) 05h09min de 26 de novembro de 2013.